CRISPR-Cas9, an RNA-guided genome editing technology, is revolutionizing cell biology due to the ease and efficiency by which it enables genetic manipulation of mammalian cells. Through targeted modification of specific genes or regulatory regions, researchers can now rapidly generate precise genetic models to study normal and diseased cell physiology. Beyond genetic manipulation for research purposes, CRISPR-Cas9 genome editing also holds great potential for therapeutic applications, including immunotherapy and regenerative medicine. The following document provides instructions for CRISPR-Cas9 genome editing of human primary T cells, including optimization of pre- and post-editing culture conditions and methods to evaluate genome editing efficiency. The mechanism of CRISPR-Cas9 genome editing is shown in Figure 1. Briefly, Cas9 endonuclease is targeted to the desired genomic locus through complementary base pairing of the associated CRISPR RNA (crRNA) at a site 5’ to a protospacer adjacent motif (PAM) sequence (NGG for Streptococcus pyogenes Cas9). The crRNA partners with a trans-acting CRISPR RNA (tracrRNA), which acts as a scaffold for the interaction with Cas9, to form the guide RNA (gRNA). Once complexed with the gRNA, Cas9 is targeted to the desired genomic locus and will generate a DNA break 3 to 4 bases upstream of the PAM sequence. Endogenous DNA repair systems then function to repair the DNA break. Non-homologous end joining (NHEJ) mediates direct ligation of the broken DNA molecule, and due to the error-prone nature of NHEJ, this can result in the formation of insertion or deletion (INDEL) mutations. If a donor DNA sequence template is provided, knock-in of precise DNA sequences can be accomplished through the homology-directed repair (HDR) pathway (Figure 1). While this technology has been successfully applied in numerous cell lines, its application in primary human immune cells has been hampered by challenges in efficient delivery and expression of CRISPR-Cas9 components. Early attempts to apply CRISPR-Cas9 for genome editing in primary human T cells used either viral vectors1,2 or plasmids3,4 for Cas9 and gRNA expression, which resulted in low targeting efficiency and high toxicity. These expression systems also pose concerns about safety in clinical translation due to the risk of unwanted genetic mutations and immunogenicity.5 More recently, electroporation of activated T cells with ribonucleoprotein (RNP) complexes made from recombinant Cas9 protein and in vitro-transcribed (IVT) or synthetic gRNAs has achieved high efficacy across a number of targets.6-10 In many cell types, including human T cells, IVT gRNAs cause high cytotoxicity due to the presence of a 5’ triphosphate single-stranded RNA (ssRNA) that activates a type I interferon-mediated immune response.11 Synthetic gRNAs are therefore a preferred format for the RNP-based method. ArciTect™ is an RNP-based CRISPR-Cas9 expression system that includes custom synthetic gRNA and is designed to fully support genome editing of human primary T cells. The RNP complex (Cas9 partnered with gRNA) orientation with respect to target and PAM sites. Cas9 generates a DNA break 3 - 4 bp upstream of the PAM sequence, triggering endogenous DNA repair pathways. This can result in the formation of INDELs if repair occurs via the NHEJ pathway or knock-in of precise sequence changes via the HDR pathway, if template DNA is included in experimental design. With improved expression and delivery methods, CRISPR-Cas9 genome editing is now rapidly being incorporated into the development of next-generation immunotherapies. One example is chimeric antigen receptor (CAR) T cell therapy, wherein CRISPR-Cas9 enables generation of allogeneic immune effector cells that are compatible for patient infusion.15 For this purpose, T cells can be engineered to escape immune rejection through deletion of endogenous T cell receptors (TCRs) and human leukocyte antigen (HLA) class I molecules, which shows high efficacy when combined with deletion of inhibitory receptors such as programmed death-1 (PD-1) or cytotoxic T-lymphocyte antigen protein 4 (CTLA-1).9-10,16-17 This strategy can then be coupled with targeting CAR constructs to the endogenous TCR alpha constant (TRAC) locus18 to generate universal allogeneic CAR-T cells. 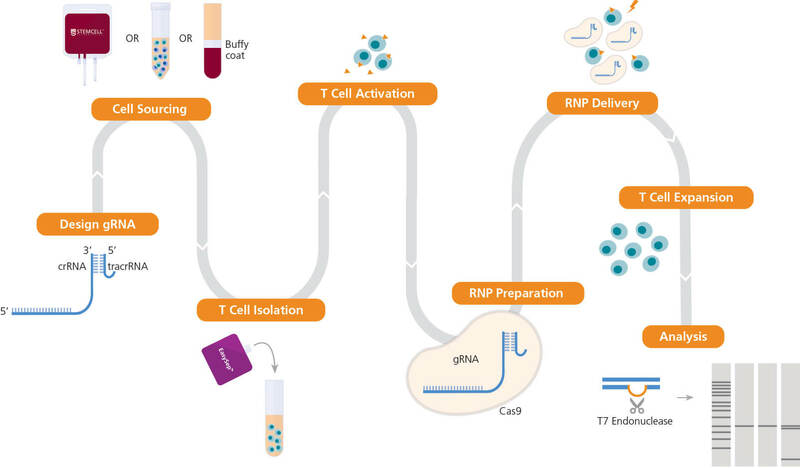 The following protocol details instructions for isolation and activation of primary human T cells, preparation of a CRISPR-Cas9 RNP complex, and delivery of an RNP complex into activated primary T cells using electroporation (Figure 2). We describe one strategy to generate knockout primary T cells with high efficiency, and present data regarding CRISPR-Cas9 genome editing of the TCRαβ locus across a number of activation conditions; see the discussion section of this document for alternative strategies and expected outcomes, as well as protocol modifications. The guide RNA sequence is designed once a target locus for editing is identified. Human primary T cells can be sourced from STEMCELL or isolated from a number of sources, including whole blood, buffy coat, washed leukaphoresis samples, or peripheral blood mononuclear cells (PBMCs), using STEMCELL column-free cell separation technology, including EasySep™. Next, T cells are activated with either ImmunoCult™ CD3/CD28 T Cell Activator or ImmunoCult™ CD3/CD28/CD2 T Cell Activator. The ArciTect™ CRISPR-Cas9 RNP is then prepared and delivered into T cells using electroporation, and cells are expanded in ImmunoCult™-XF T cell expansion Medium. Editing efficiency can be analyzed using the ArciTect™ T7 Endonuclease I Kit or flow cytometry, if the experimental design permits. Orange triangles indicate ImmunoCult™ Human T Cell Activator. Isolate human T cells from peripheral blood (e.g. Catalog #70500) using EasySep™ Human T Cell Isolation Kit. Refer to the Product Information Sheet (Document #DX20004) for details. Optional: Source frozen primary T cells (e.g. Catalog #70024). Refer to the Product Information Sheet (Document #DX27569) for details. Count cells and adjust to 1 x 106 cells/mL in ImmunoCult™-XF T Cell Expansion Medium supplemented with 2 mM L-Glutamine, 50 μg/mL gentamicin, and 10 ng/mL (130 IU/mL for the specific lot) Human Recombinant IL-2. Activate human T cells by adding 25 μL/mL of ImmunoCult™ Human CD3/CD28 T Cell Activator. Incubate cell suspension at 37°C and 5% CO2 for 72 hours. Optional: Assess T cell activation by binding the activation marker CD25 with Anti-Human CD25 Antibody, Clone BC96 (Catalog #60158) and performing flow cytometry. Briefly centrifuge the vials of ArciTect™ crRNA and ArciTect™ tracrRNA before opening. Add nuclease-free water to each vial to give a final concentration of 200 μM, as indicated in Table 1. Mix thoroughly. If not used immediately, aliquot and store at -80°C for up to 1 month. After thawing the aliquots, use immediately. Do not re-freeze. Prepare a 60 μM guide RNA solution by combining components in an RNase-free microcentrifuge tube as indicated in Table 2. Volumes are sufficient for a single electroporation reaction; adjust as required. Mix thoroughly. In a thermocycler or heating block, incubate guide RNA solution at 95°C for 5 minutes followed by 60°C for 1 minute. Cool to room temperature and place on ice. To prepare the ribonucleoprotein (RNP) complex, combine 60 μM guide RNA (prepared in step 2) and ArciTect™ Cas9 Nuclease (or ArciTect™ Cas9-eGFP) in an RNase-free microcentrifuge tube as indicated in Table 3. Volumes are sufficient for a single electroporation; adjust as required for the desired number of wells. If using 3 μg/μL ArciTect™ Cas9-eGFP Nuclease, add 11.4 μL of Cas9-eGFP to 6 μL of 60 μM guide RNA and 2.6 μL of Resuspension Buffer T for a total volume of 20 μL. Note that 1 μg/μL ArciTect™ Cas9 should not be used for Neon® electroporation, as the total Resuspension buffer volume should represent ~90% of the total reaction volume. Mix the RNP Complex Mixture by gently pipetting up and down 2 times; avoid creating air bubbles or foam in the tube. Incubate the RNP Complex Mixture at room temperature (15 - 25°C) for 10 - 15 minutes. For each electroporation condition (including positive and negative controls), prepare 2 mL of ImmunoCult™-XF T Cell Expansion Medium supplemented with 2 mM L-Glutamine, 50 μg/mL gentamicin, and 10 ng/mL Human Recombinant IL-2. For each condition, add 2 ml of supplemented medium (prepared in step 1) to 1 well of a 6-well plate and place in a 37°C incubator. Store the remainder of the supplemented medium at 2 - 8°C. Transfer 1.2 x 106 cells from the activated T cell suspension (prepared in section A) to a 15 mL conical tube. Centrifuge at 300 x g for 5 minutes at room temperature. Aspirate medium and resuspend cells in 100 μL of Resuspension Buffer T.
Using individual RNase-free microcentrifuge tubes for each condition, combine RNP Complex Mixture (prepared in section C) with activated T cells as indicated in Table 4. Mix gently by pipetting up and down carefully 2 times; avoid creating air bubbles or foam in the tube. Note: If air bubbles are present in the tip when the cells are electroporated, cell viability and transfection efficiency will be significantly reduced. Note: Refer to the manufacturer’s instructions for electroporation. Electroporation conditions may require optimization for different cell types. Use a 100 μL Neon® pipette tip to draw up 100 μL of the mixture and place into the electroporation chamber containing 3 mL of Electrolytic Buffer E2. Electroporate mixture according to conditions indicated in Table 5. Immediately add the electroporated cells to 1 well of the 6-well plate prepared in step 2. Incubate at 37°C and 5% CO2 for 2 - 3 hours. Count cells and adjust cell density to 2.5 x 105 viable cells/ mL by adding IL-2-supplemented ImmunoCult™-XF T Cell Expansion Medium (prepared in step 1). Optional: If using Cas9-eGFP nuclease, assess electroporation efficiency 12 - 24 hours after electroporation by flow cytometry. Incubate at 37°C and 5% CO2 for 48 - 72 hours for genome editing to occur. Harvest cells for assessment of genome editing efficiency, genomic DNA can be amplified by PCR using primers flanking the target region and ArciTect™ High-Fidelity DNA Polymerase Kit (Catalog #76026), followed by sequencing of PCR products. Alternatively, ArciTect™ T7 Endonuclease Kit (Catalog #76021) can be used to assess editing efficiency (% INDEL formation) following PCR amplification. For further information, refer to the Technical Bulletin: Evaluation of Genome Editing (Document #27126), available at www.stemcell.com or contact us to request a copy. 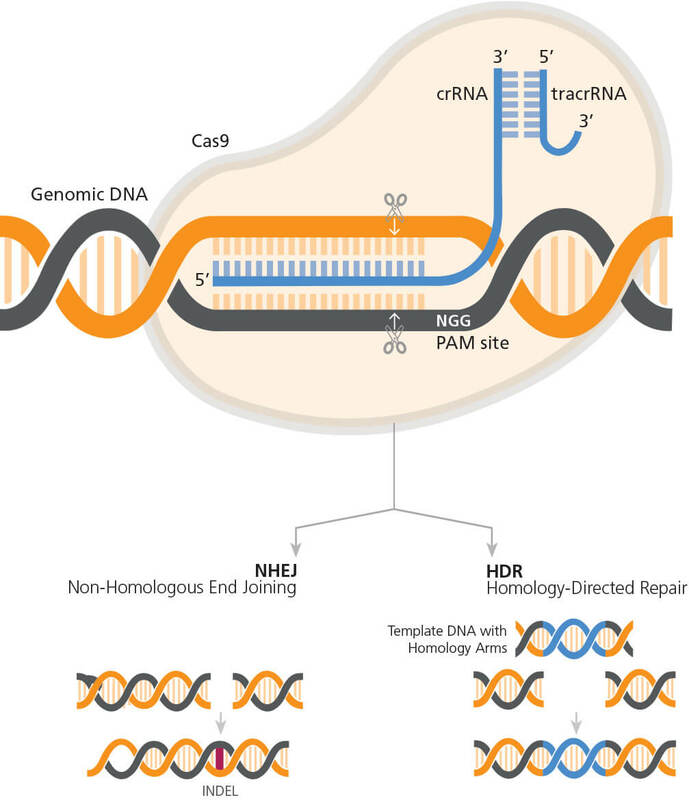 We first designed multiple crRNAs (Figure 3A, D), as different crRNA sequences can exhibit varying efficiency at the target site (see Technical Bulletin: Genome Editing with Direct Cas9 RNP Delivery Design Considerations, Document #27083). We tested the efficacy of the four crRNAs in activated human T cells, with TRAC knockout efficiency detected by flow cytometry, and INDEL generation detected by the ArciTect™ T7 Endonuclease I Kit. All four crRNAs significantly reduced the frequency of TCRαβ+ cells (Figure 3B) and resulted in cut bands in the T7 endonuclease I assay (Figure 3C), confirming the presence of genomic mismatches that are indicative of INDELs. Based on these results, we proceeded with crRNA2, as it showed the highest knockdown efficiency by flow cytometry. We then used the validated crRNA2 to compare knockout efficiency in a variety of T cell activation conditions. First, T cells were isolated from the human peripheral blood of four independent donors. Cells were cultured in Immunocult™-XF T Cell Expansion Medium supplemented as described with either ImmunoCult™ Human CD3/CD28 T Cell Activator or CD3/CD28/ CD2 T Cell Activator for 2 or 3 days, for a total of 4 test conditions. On day 0, approximately 10 - 20% of cells expressed the activation marker CD25 (data not shown), which increased to over 80% after 2 or 3 days in the presence of the activators (Figure 4). T cell activation was greater when cells were incubated with the CD3/CD28/CD2 T Cell Activator compared to the CD3/CD28 T Cell Activator (Figure 4). The percentage of activated cells was also greater when cells were incubated with either activator for 3 days compared to 2 days (Figure 4). For more information about optimization of T cell activation and expansion conditions, refer to the Technical Bulletin: Optimization of Human T Cell Expansion Protocol: Effects of Early Cell Dilution (Document #27143), available at www.stemcell.com or contact us to request a copy. (A) Schematic of the TRAC locus with crRNA sequences 1 - 4 aligned to the TRAC first exon. (B) Representative TCRαβ/CD3 flow cytometry results at 48 hours post RNP complex electroporation (containing the corresponding crRNA1 - 4) into activated T cells. 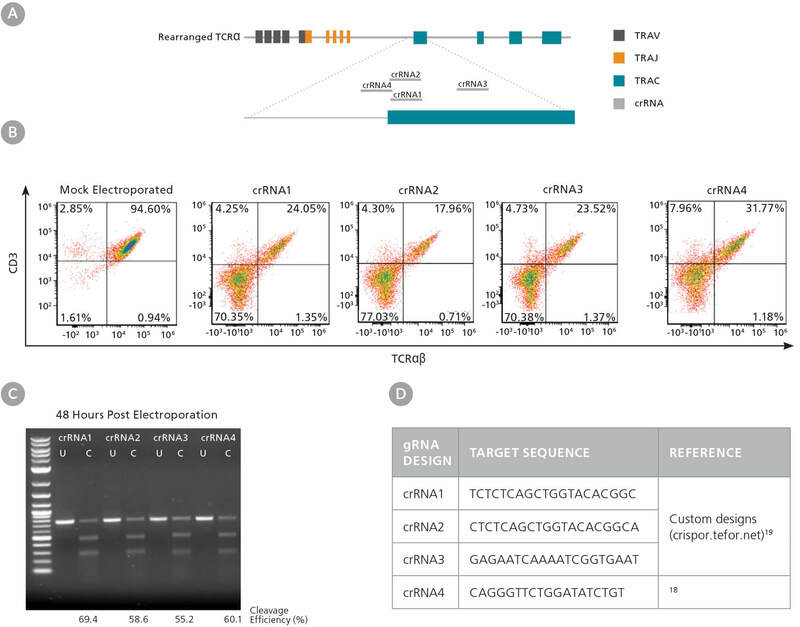 (C) Genome editing (cleavage) efficiency was assessed at 48 hours post electroporation using the ArciTect™ T7 Endonuclease I Kit. U: Uncut; C: Cut: (D) gRNA target sequences for TRAC knockout. Isolated human T cells were activated with either ImmunoCult™ Human CD3/ CD28 or CD3/CD28/CD2 T Cell Activator for 2 or 3 days. Activation status was assessed by CD25 flow cytometry. Each data point per condition represents an individual donor; n = 4 - 8 donors. Error bars represent standard error of the mean. (A) TRAC knockout efficiency in human T cells activated with either ImmunoCult™ Human CD3/CD28 or CD3/CD28/CD2 T Cell Activator for 2 or 3 days was assessed by binding the TCRαβ and CD3 receptors with antibodies followed by flow cytometry analysis. Each data point per condition represents an individual donor; n = 4 - 8 donors. Error bars represent standard error of the mean. (B) Genome editing (cleavage) efficiency was assessed at 48 hours post electroporation in human T cells activated with ImmunoCult™ Human CD3/CD28 T Cell Activator for 3 days using the ArciTect™ T7 Endonuclease I Kit. Mock electroporated: - RNP; RNP electroporated: + RNP. (C - D) Representative dot plots of TCRαβ and CD3 flow cytometry analysis from (C) mock electroporated and (D) RNP electroporated human T cells activated with ImmunoCult™ Human CD3/CD28 T Cell Activator for 3 days. (E) Representative dot plot of CD4 and CD8 flow cytometry analysis of human T cells activated with ImmunoCult™ Human CD3/CD28 T Cell Activator for 3 days. Following activation, T cells were electroporated with RNP complexes containing TRAC crRNA2. Viability ranged from 52 - 82% (data not shown) immediately after electroporation, independent of activation condition. Knockout efficiency was measured 3 days after electroporation (day 5 or 6 from start of activation), and we observed up to 90% increase in knockout efficiency (TCRαβ- cells; Figure 5A). 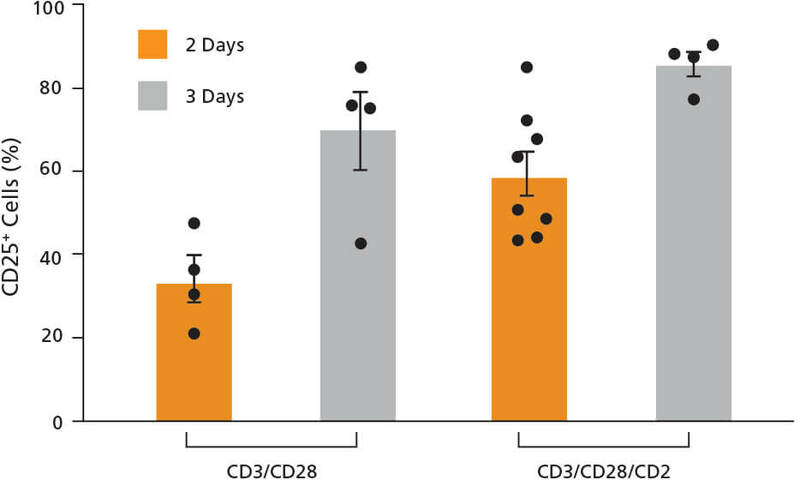 The highest consistent knockout efficiencies were observed when cells were electroporated after 3 days of activation, particularly when the ImmunoCult™ Human CD3/CD28 T Cell Activator was used (Figure 5A). Moreover, INDEL formation at the target locus was confirmed by the T7 endonuclease I assay in treated samples from all 4 donors (Figure 5B). Results were more variable among donors when cultured with the ImmunoCult™ Human CD3/CD28/CD2 T Cell Activator over 2 days, with one non-responsive sample. We therefore tested an additional 4 donors with that condition and observed more consistent knockout in all additional samples. As TCRαβ forms a complex with CD3, the knockout was confirmed by concomitant loss of CD3 expression on the cell surface (Figure 5A, C, D), while T cell markers CD4 and CD8 continued to be highly expressed (Figure 5E). Following CRISPR-Cas9 genome editing, cells were cultured an additional 10 days by adding in fresh Immunocult™-XF T Cell Expansion Medium supplemented with IL-2 every 2 - 3 days. TCRαβ- cells persisted over the course of expansion (data not shown). Cells treated with ImmunoCult™ Human CD3/CD28/CD2 T Cell Activator prior to electroporation exhibited a higher degree of expansion post gene editing compared to those treated with ImmunoCult™ Human CD3/CD28 T Cell Activator. Based on the fold expansion, calculated cell yields ranged from 4.1 x 107 to 3.8 x 108 cells after 7 days of incubation post-electroporation. In editing primary human T cells, there exists a delicate balance between cell exhaustion, cell viability, and gene editing efficiency. We found that stimulation with ImmunoCult™ Human CD3/CD28 T Cell Activator for 3 days prior to electroporation resulted in the highest and most consistent editing efficiencies. Greater cell expansion post editing was observed for cells stimulated with ImmunoCult™ Human CD3/CD28/CD2 T Cell Activator; consider the output cell number required for downstream applications when choosing a protocol. If a greater number of edited cells are required for downstream applications, one can also scale up with more cells per electroporation or with more wells. In general, two wells are recommended for positive (e.g. ArciTect™ Human HPRT Positive Control Kit, Catalog #760134) and negative (non-electroporated) controls. The total number of wells should be determined before starting, to calculate the total amount of materials required. Optimization of conditions such as cell density or Cas9:gRNA ratio may be necessary, or multiple donor samples may be required (e.g. diseased and healthy). The genome editing strategy outlined in this document is typical for most genetic knockout applications. Application-specific protocol modifications, not thoroughly detailed here, might include: use of ArciTect™ Cas9-eGFP Nuclease (Catalog #76005) for visualization of positive transfectants; use of the single-strand endonuclease ArciTect™ Cas9 Nickase (Catalog #76007) with two flanking gRNAs; or the addition of a DNA donor template for homology-directed repair (HDR)-mediated genetic knock-in. Wang W et al. (2014) CCR gene disruption via lentiviral vectors expressing Cas9 and single guided RNA renders cells resistant to HIV-1 infection. PLoS One 9:e115987. Li C et al. (2015) Inhibition of HIV-1 infection of primary CD4+ T-cells by gene editing of CCR5 using adenovirus-delivered CRISPR/Cas9. J Gen Virol 96:2381–93. Mandal PK et al. (2014) Efficient ablation of genes in hematopoietic stem and effector cells using CRISPR/Cas9. J Gen Virol 163: 1817–26. Su S et al. (2016) CRISPR-Cas9 mediated efficient PD-1 disruption on human primary T cells from cancer patients. Sci Rep 6: 20070. Yin H et al. (2014) Non-viral vectors for gene-based therapy. Nat Rev Genet 15: 541–55. Hendel A et al. (2015) Chemically modified guide RNAs enhance CRISPR-Cas9 genome editing in human primary cells. Nat Biotechnol 33: 985–9. Shumann K et al. (2015) Generation of knock-in primary human T cells using Cas9 ribonucleoprotein. Proc Natl Acad Sci USA 112: 10437–42. Gomes-Silva D et al. (2017) CD7-edited T cells expressing a CD7-specific CAR for the therapy of T-cell malignancies. Blood 130: 285–96. CAR T cells resistant to PD1 inhibition. Clin Cancer Res 23: 2255–66. Kim S et al. (2018) CRISPR RNAs trigger innate immune responses in human cells. Genome Res 28: 1–7. Seki A & Rutz S (2018) Optimized RNP transfection for highly efficient CRISPR/Cas9-mediated gene knockout in primary T cells. J Exp Med 215(3): 985. Hou P et al. (2015) Genome editing of CXCR4 by CRISPR/Cas9 confers cells resistant to HIV-1 infection. Sci Rep 5: 15577. Hultquist JF (2016) A Cas9 Ribonucleoprotein Platform for Functional Genetic Studies of HIV-Host Interactions in Primary Human Cells. Cell Rep 17: 1438–52. Jung I-Y & Lee J (2018) Unleashing the therapeutic potential of CAR-T cell therapy using gene-editing technologies. Mol Cells 41(8): 717–23. Liu X et al. (2017) CRISPR-Cas9-mediated multiplex gene editing in CAR-T cells. Cell Res 27: 154–7. Ren J et al. (2017) A versatile system for rapid multiplex genome-edited CAR T cell generation. Oncotarget 8: 17002–11. Eyquem J et al. (2017) Targeting a CAR to the TRAC locus with CRISPR/Cas9 enhances tumour rejection. Nature 543(7643): 113–7. Haeussler M et al. (2016) Evaluation of off-target and on-target scoring algorithms and integration into the guide RNA selection tool CRISPOR. Genome Biol 17: 148.